Heather woke up, wrapped in the sheets and sweating her little old head off. Dave was curled up at the end of the bed, his injuries finally healed. The nightmare had been particularly disturbing this time. It'd been Christmas, she'd laid out a bunch of donuts and Ryan had eaten one and fallen over. They'd arrested her and slammed her in jail for good. Another day in Hillside paradise. Hopefully, it'd be a murder-free one. The teaser made me laugh. 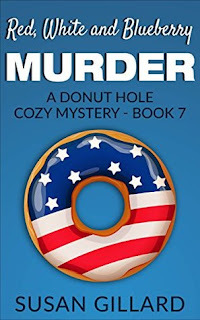 There's not many murder free days in these small cozy mystery towns! I laughed at the teaser. Any day that is murder-free must be a good one, I guess! The teaser is funny! I'd read more of this cozy. Death by donuts! Oh no.